Last week saw me enjoy a fun test shoot with agency model, Milota, and a fantastic team. The shoot took place at Bristol’s Cox and Baloney’s, a cool, quirky vintage boutique on Cheltenham Road, which itself feeds in to Gloucester Road, famous for its assortment of interesting independent business and dubbed by one national newspaper ‘Britain’s last real high street’. For the shoot I assembled Ellee Hitchens, who’s work I had seen several times and was really keen to work with, and Gemma Smart, an inventive hair stylist currently working local for Mack Daddies. 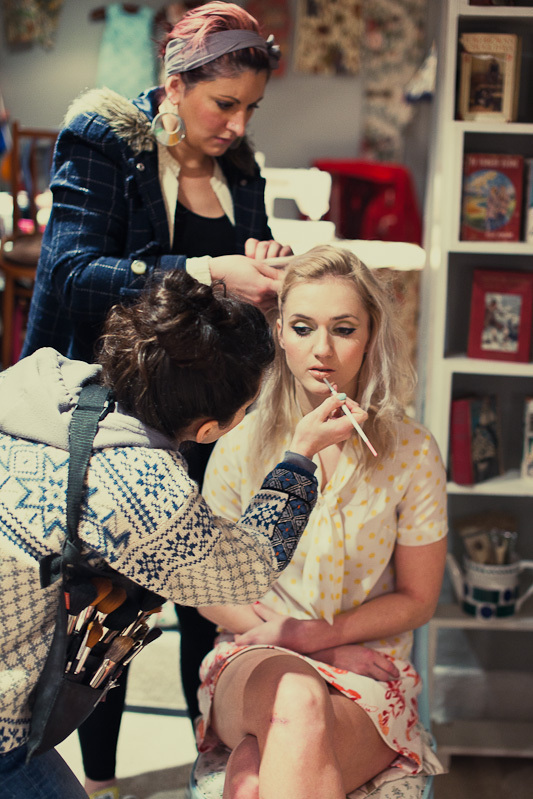 Makeup artist Ellee Hitchens and hair stylist Gemma Smart prepare for the second half of the shoot. Milota, represented by Bath-based agency ShootDHS, is a striking Slovakian model and together with the shop’s boho vibe I was somehow reminded of Czechoslovakian new wave cinema like Valerie and her Week of wonders and especially Daises, and used that early 70s feel to communicate what I was after to the hair/makeup team. 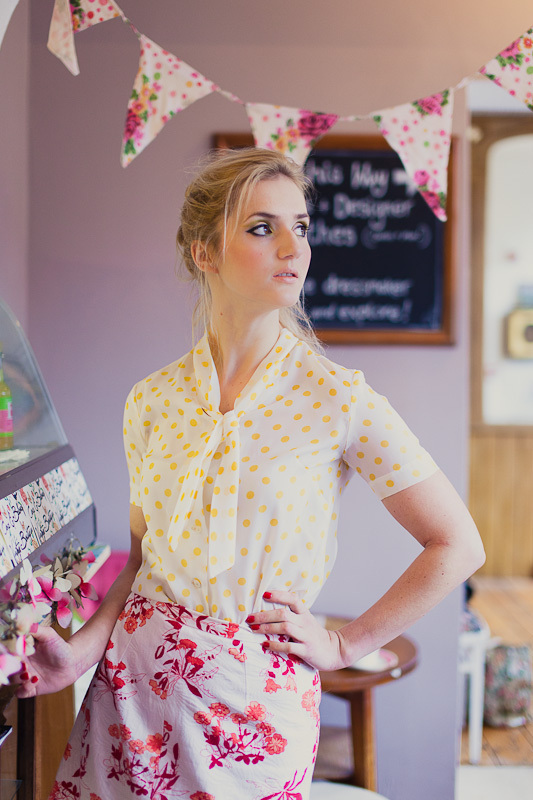 Summery vintage-style fashion. Milota relaxes with a book at Cox and Baloneys. Cox and Baloney’s has a unique bohemian vibe offering plenty of instantly usable backdrops for photography. Downstairs is a bookstore, ‘Bud’s Books’, with an eclectic mix of used titles and a full dressmaking and alterations service, twentythreeworkshop, run by Laura. If you're looking for a fabulous dress for summer, checking out twentythreeworkshop, based downstairs at Cox and Baloneys. Milota reclines downstairs in Bud's Books as Cox and Baloneys. For the shoot we had two outfits. One was kindly loaned by Laura, and the other made up of retro items from the assortment upstairs. I decided to create two distinct looks for each outfit, shooting downstairs with my Bowens Gemini 500 studio flash and TravekPak (there was not much usable natural or ambient light to speak of) for a more stylised look and then, shooting upstairs with fast prime lenses where there was plenty of window light. We also had hair stylist Gemma put the hair up for the second shot, hopefully giving an impression of two completely separate shoots – test shoots are all about trying our new ideas. I shoot a lot with my Sigma 50mm f/1.4 these days, which is a truly brilliant little lens. Sigma is really coming out with lenses that are great in their own right, rather than simply being a cheaper versions of Canon’s offerings. In fact, the Sigma 50mm is pricier than Canon mid-range 50mm, but still well short of their L-series lens. The Sigma delivers beautiful out-of-focus areas and remain acceptable sharp at its widest aperture, if you’re careful to nail focus. I also made heavy use of another favourite, my Canon 85mm f/1.8, which is my go-to glass for portraits. It was an enjoyable, relatively short photo shoot with an absolutely first rate team and I’m sure everyone will have something fabulous of their portfolios. You can find Milota’s ShootDHS agency profile here, while Ellee Hitchens’s website can be found here. If you’ve never visited Cox and Baloney’s, check out their website too. Dressmaker Laura has her own blog here.